I love Halloween. I don’t really dress up in costumes anymore (officially too old for shenanigans, plus, lazy and poor), but I still love seeing all the little ghouls and goblins roaming around. This year, I’ll be lucky if I can afford a king size bag of candy to give away. So, in the spirit of Christmas Halloween, I thought I’d put together a wish list of things y’all, the internet, could contribute to my scare the crap out of children Halloween plan. Really? For $600, they couldn’t throw in a couple of batteries? Tightwads. I’ll also need a smoke machine to make that fog in the picture. And, of course, his steed (not included). 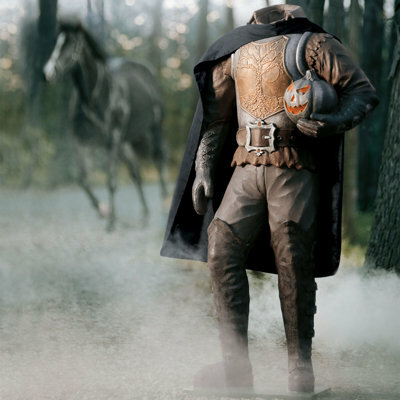 He’s not only a headless horseman, but a horseless horseman. Dude! How rad is that? I’d keep it up year round. At only $299, it’s a bargain at twice the price! Oh, this one includes a light bulb! 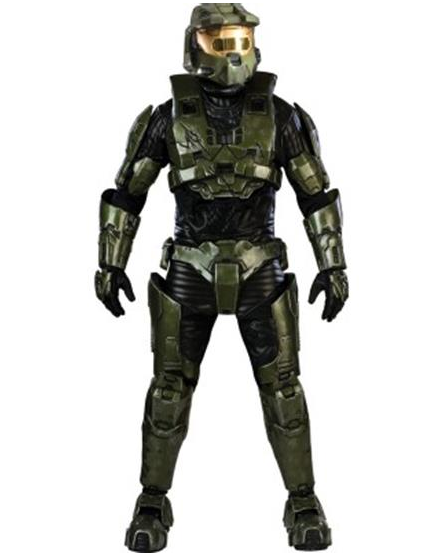 I’ve never played Halo 3, but this costume looks pretty badass. I bet it would be excellent armor against any sort of Halloween shenanigans perpetrated against you. It ought to protect you since it’s on sale for a low price of $799. No, that price isn’t missing a decimal place. Pffft. 800 bucks and it doesn’t even come with a gun. Lame. This one is a must for any Fish. 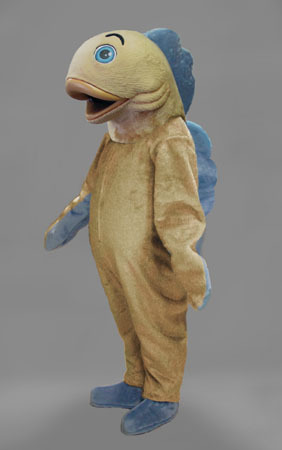 For only $1,346.18 + $130.00 shipping, you too can be a fish! Unfortunately, it says “usually ships within 3 to 5 weeks” so no fish for Halloween this year. Sadface. I WANT MY OWN DRAGON! No, I didn’t! I never thought that. Realistic markings are super important in a dragon, but I am highly disappointed that he doesn’t breathe fire. 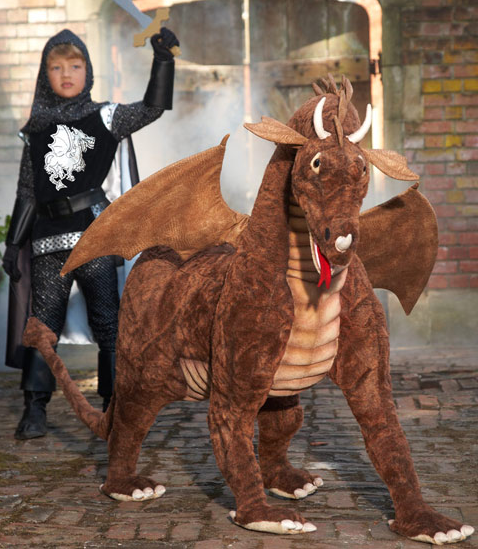 This non-fire breathing dragon will set you back $998.00. He also comes in a red version. Oh, and they have a T-rex, too. It doesn’t specify, but I assume the child is sold separately. Now, this is more my speed. I would look awesome in that. Sword not included! You’d think for $258.95, they could throw in a damn sword. Cheap bastards. I don’t see a downside here other than the $299.99 price tag. But what’s $299.99 (plus tax and shipping) compared to FRANKENSTEIN? You could use him as home security off-season. I’M BATMAN! 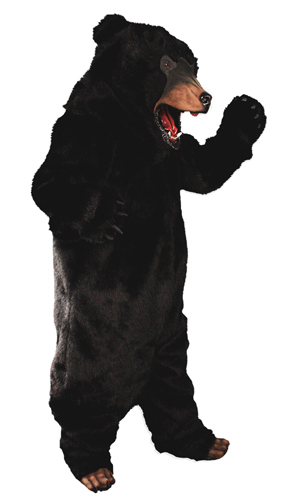 Or I could be if you bought this costume for me. People really collect Batman costumes? It says one size fits most adults. If I were to spend $799.99 on a costume, it damn well better fit. This one looks a little too realistic, but what would Halloween be without zombies? In the off-season, I would store her in the basement and scare the crap out of any unsuspecting hot water heater repairmen. It would be awesome. Two years to make a zombie? That seems excessive. I could make one in about ten minutes. 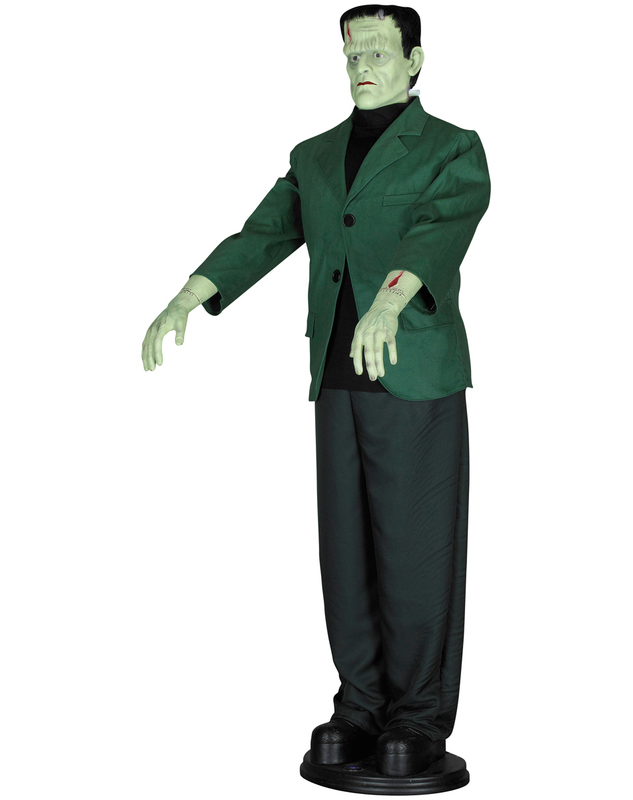 Also, it’s good to know that poseable Halloween props are poseable. 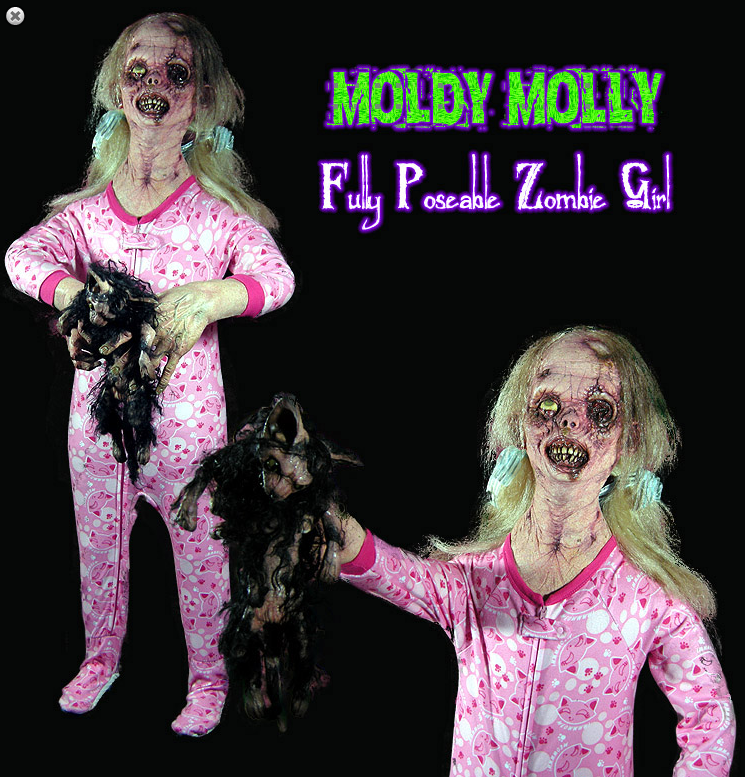 Moldy Molly will set you back $399.99. I’d like to know what’s so complete about him. Do they also sell an incomplete costume? I want to be a bear. Really, being a bear sounds pretty nifty. This bear is marked down from $700 to only $574.95 because the last thing I need is a floppy bear head! I need it! He also comes in brown. I would dress her in that year-round because I’m mean and a terrible pet owner. I’ll need a large. There’s my Halloween wish list. If you’d like to buy any of these things to make my Halloween extra special this year, that’d be swell. Actually, on second thought, I’d prefer the cash. 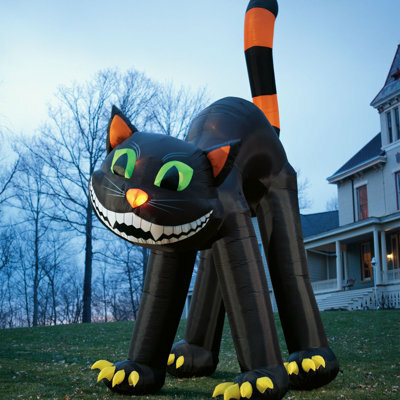 Although, that giant inflatable cat would be awesome. Posted in funny business, lists and tagged Costume, Halloween, Halloween costume. Bookmark the permalink. Words cannot describe the awesomeness of this. That Viking Queen totally reminded me of Barberella for some reason. I would rock that viking queen outfit. You’re never too old to dress up for Halloween. We just can’t beg for free candy. The fish looks like one of the cast from the original “The Wicker Man”. OMG. Yeah, I can see you in the Viking costume. 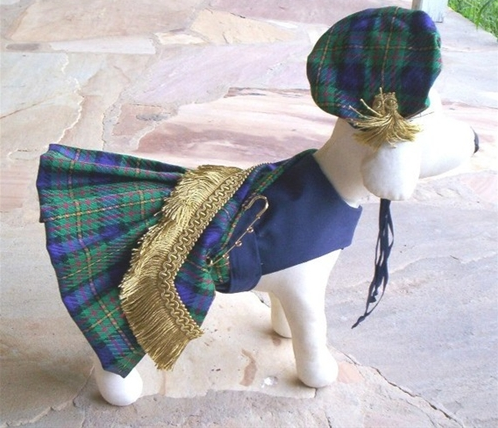 What I can’t see is your dog in the kilt. Maybe I’m wrong, but I think that’s called an ugly napkin tied around her waist. My dog would hate me forever. Not to mention that Male said he would call animal services on me if I ever dressed her up. Maybe just a very butch spiked collar – in pink? People really pay that much money for a costume? I have no idea, but lots of places sell stuff that spendy so someone must be buying it. I think the cheap costumes they sell at those pop-up stores are already horrifically overpriced, and they’re under $50. That dragon is just … awesome. I wants it. I needs it. I shall name it precious. lol. I already named my dragon Hector. 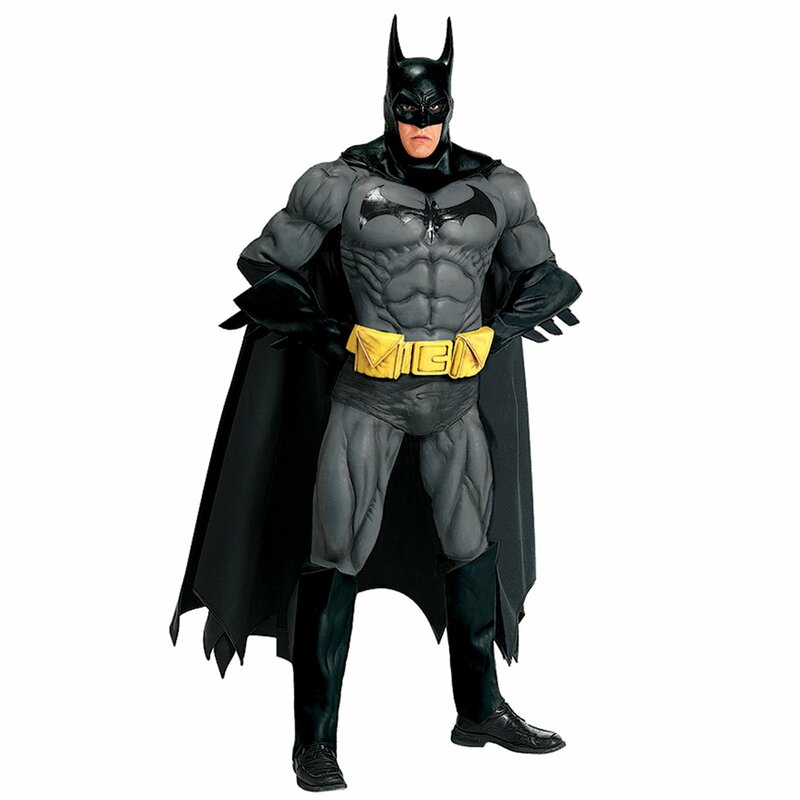 I would like a 2.5′ Batman guard. Hector is an excellent dragon name! Hysterical. I’m beyond mortified at the prices on some of these things. Halloween is less than week after my birthday, so some years I’m really into it and others not so much. If I do anything this year, it’s going to be for me. I can’t get over how expensive this stuff is. I can’t afford to buy you any of these things. But, I could send you a bag of candy… if you want? And if you find some nice benefactor who is going to snap up some of these “deals” and send them your direction, let me know, because I could use that dragon too. I think we all need one of those dragons actually. Of course. That’s the way it is supposed to be. They probably made the T-Rex with her in mind. LOL, apart from the dog and Viking girl costume, you could get a second hand motor car for the price of those !things. Love the giant cat though! Wow, talk about sticker shock! Damn shame on the viking costume too…. I could carve you a scary squirrel o’lantern like the one I did last year, but I don’t know how well that would hold up in the mail…. 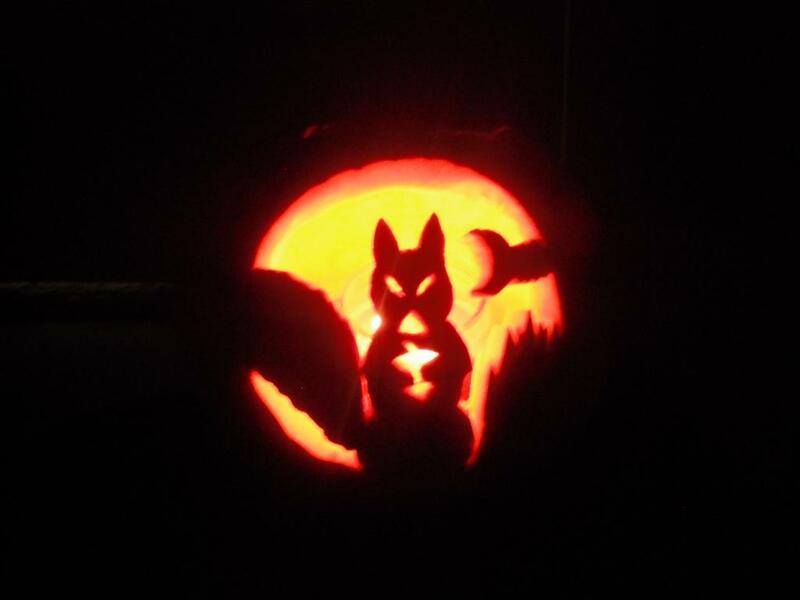 That squirrel o’lantern is amazing! I’ve never been any good at carving punkins. I find the medium too difficult to work with. I like the cat the most. I love the idea of putting the zombie toddler in the basement for water heater repair men, or any unruly or uninvited guests. Looking at those prices I’m hoping I’ve made a mistake with the USD-GBP exchange rate. The inflatable cat is pretty awesome, mind. Unfortunately, no mistake. Those prices are as ludicrous as they seem. The giant inflatable cat is the best bargain. Does the Viking queen costume include the strange plastic breasts?